I fully accept that Homo sapiens has a slightly unusual mammalian trait of murdering peers for no worthy gains, but I will never understand it. To paraphrase Bernstein’s thoughts, mass murder committed out of sheer ignorance and hatred can never be allowed to replace learning and reason as the basis for ALL of our actions, particularly through the arts. This past week I attended the mesmerizing two-person drama, Annapurna, at The Duluth Playhouse. John Pokrzywinski as Ulysses and Christine Winkler Johnson as Emma never dropped the intensity of their challenging dialogue after a twenty-year hiatus in their relationship. Over that separation, Emma had attempted to find meaning in other relationships, while Ulysses retreated inward, and finally threw away alcohol to pour his fragmented energies into an epic poem about his passionate, yet failed, relationship with Emma. No scene changes, just super-charged dialogue. Finally, near the conclusion, Ulysses brings the box containing his epic manuscript to the table, and they begin reading together the fully exposed soul of Ulysses and his journey. While John and Christine are very discerning actors, I’m sure director Julie Ahasay had plenty of suggestions to make the relationship even more dynamic than anyone imagined. What a great stage performance by this pair, and I find it quite thrilling to watch a play written by Sharr White in 2011 at The Duluth Playhouse in 2016. Since I was unavailable to attend the official concert by the Three Bridges International Chamber Music Festival, I had the opportunity to come to the home of Bill and Laurie Bastian for a Sunday afternoon presentation by the Highland String Quartet and three singers, all shaped together by director Samuel Martin. 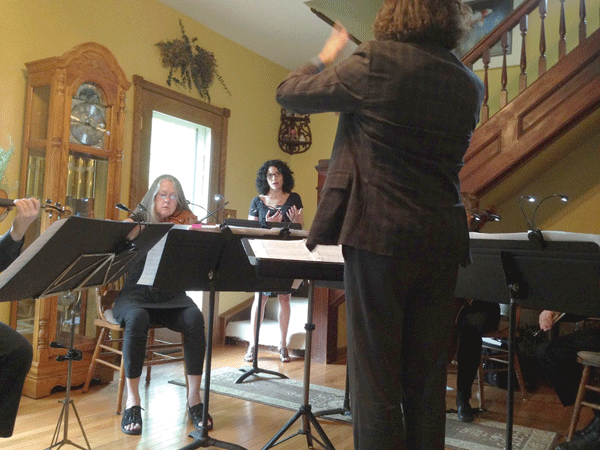 Steve Highland, Laurie Bastian, Betsy Husby, and Ron Kari were in great shape, and played very challenging string parts, since a full orchestra would have been a bit much for the Bastian front room. Baritone Gustavo Jimenez sang a variety of selections from Rossini to Claude-Michel Schoenberg. Mezzo-soprano Bettina von Hindte sang Mozart, Puccini, and Gershwin. Mezzo-soprano Laura Nie shared beautiful music from Gluck and Vivaldi with a delicate sensitivity in these seldom heard selections. Lastly, I want to continue to encourage you to attend the upcoming revision of Les Uncomfortables, an opera by Tyler Kaiser, based on a script by Margie Preuss and Jean Sramek. No opera has ever been more Duluthian than this saga about Daniel Greysolon and a host of unlikely, but very lovable, characters. This will be on stage at the Lincoln Park School Auditorium on June 23 and 24 at 7:30pm, and on June 26 at 2:00pm. Since a lot of new musicians have arrived in Duluth since 2002, many of the cast members are new to this show. If you saw it before, it will be different this time. If you have never seen it, you need to update your awareness of some suggested interpretations of the early days of Duluth, MN, USA. You will not be disappointed, and you will be marvelously entertained. Without question, Bernstein would have been pleased with our current artistic, Duluth scene. Following all violence, our music is NOT the same. But our ongoing reply to violence will be “to make music more intensely, more beautifully, more devotedly than ever before.” With every note we will honor the dead and join hands and hearts with those who embrace Learning and Reason with passion.